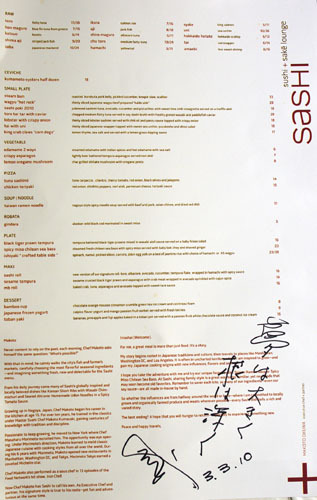 I once asked Michael Voltaggio what his favorite food spots in LA were, and Sashi was one of 'em. Ever since that conversation, I'd always been mildly curious about the place, so when I was invited to this media dinner, I jumped on the opportunity. Also invited were Cary of Sushi Lush (who helped organize the event), Christie of Pardon My Crumbs, Fiona of Gourmet Pigs, Javier of Teenage Glutster, Matt of Mattatouille, and Sonja of The Active Foodie. Sashi is helmed by Nagoya native Makoto Okuwa. As a child, Okuwa was torn between becoming either a chef or a carpenter. Persistent allergies, however, kept him indoors, and so at age 15, Okuwa began his culinary career, starting out as a sushi apprentice. He trained for over ten years, gradually learning and perfecting the art of traditional Japanese cuisine under chefs Makoto Kumazaki and Shinichi Takegasa. 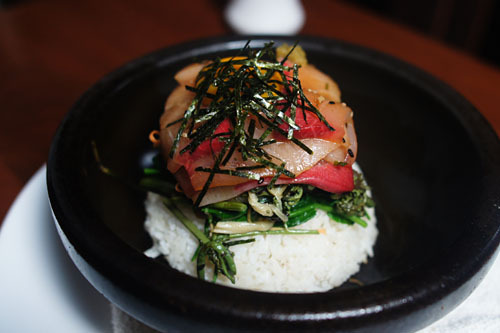 Wanderlust struck, however, and the Chef eventually relocated to Washington DC, where he worked at Sushi Taro. It was during this time when Okuwa would meet, coincidentally, famed Iron Chef Masaharu Morimoto. The two hit it off instantly, and before long, Morimoto hired Okuwa as the head Sushi Chef at his eponymous restaurant in Philadelphia. 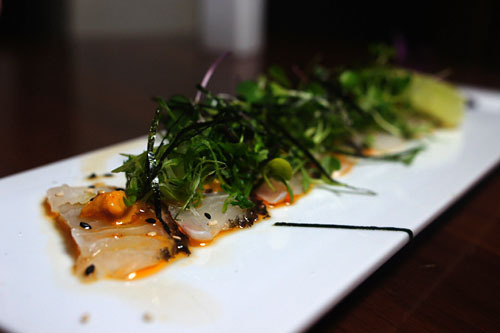 In 2006, when Morimoto opened up his second restaurant in New York, he scouted Okuwa to oversee the eatery's sushi menu. All in all, Okuwa spent an eye-opening six years along the Iron Chef's side, opening up various new restaurants and even appearing on television as Morimoto's sous chef. 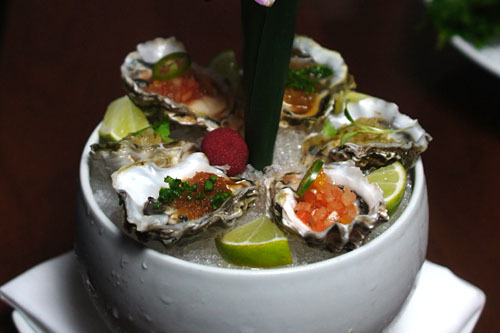 The West Coast beckoned, however, and in 2007, Okuwa moved to Del Mar, where he opened Pearl Sushi Restaurant & Champagne Lounge. After Pearl was damaged in a fire, Okuwa was recruited by Greg Harris and Jeff Benson to head up the kitchens at Sashi, bringing his Morimoto-inspired ways to Los Angeles. 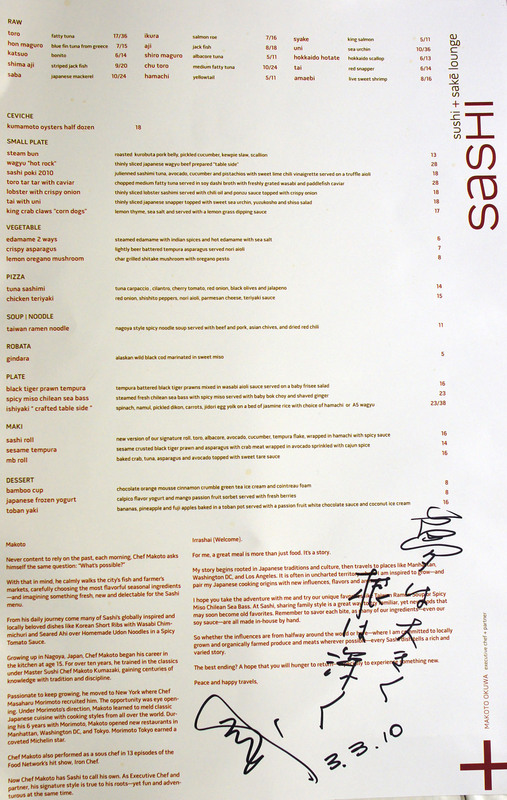 With Okuwa along as a partner, Sashi debuted in August 2008 in the old Deli Boys space at Manhattan Beach's Metlox Plaza. 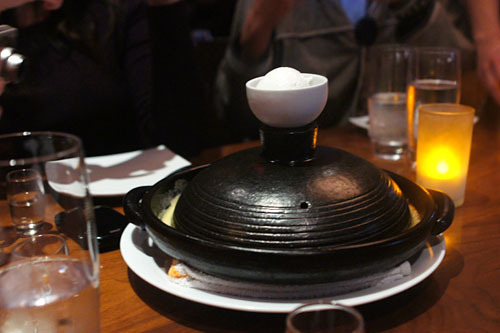 KAA Design Group, the people behind Comme Ça, redid the interior space to better suit Sashi's progressive Japanese menu. You enter through the sake lounge; on your left is the indoor dining room and sushi bar, which opens up to an outdoor patio area (where we were seated for most of the night). The menu shown above is a subset of the restaurant's larger carte, focused on the dishes that we were served (though we didn't have everything listed). Anyone know what Chef Makoto wrote? Click for a larger version. In addition to a very strong assortment of sakes, Sashi also has a decent cocktail list. 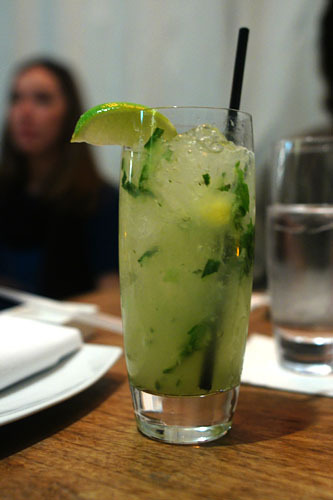 I started with the Fresh Ten, made with 10 Cane Rum, cucumber, lime juice, and agave nectar. 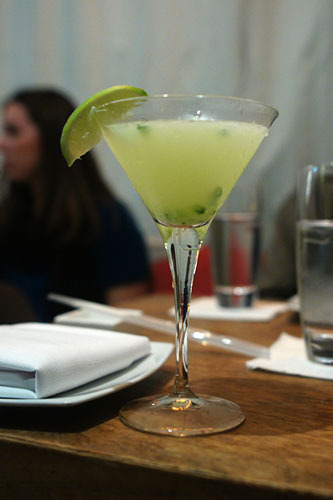 It was a refreshing concoction, with loads of cucumber up front, and an earthy, woody close. I also tasted Javier's VeeV Cooler (Veev Açai, St. Germain, basil, cucumber, lemon juice, agave nectar, Sprite), a mojito-esque drink with a sweet, almost candied finish. Amuse Bouche: "New England Clam Chowder"
The meal got off to a strong start with Okuwa's reimagination of the classic clam chowda'. The Chef starts with a light, ethereal Bazaar-like "airbread." 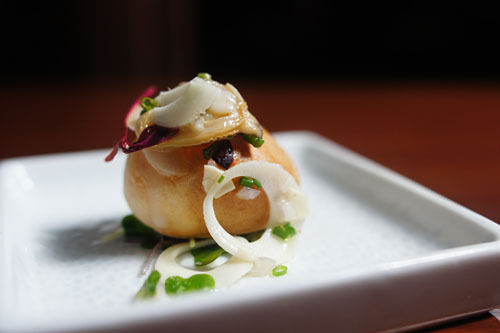 He then infuses this oyster cracker-esque base with clam chowder, tops it with a juicy Manila clam and some heady truffle oil, and tosses in some bitter micro greens. The overall effect preserves the essence of clam chowder, while also kicking it up a knock in complexity. Very nice. 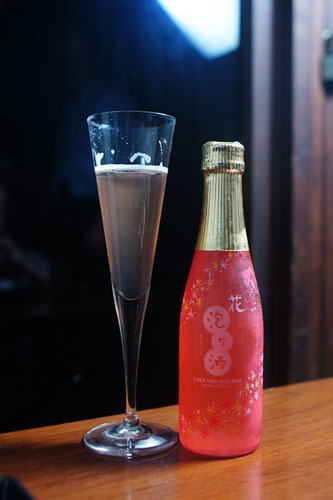 With our cocktails dispensed with, we moved on to the "Flower Sparkling" Hana Hou Hou Shu, an easy-drinking, sweet, floral, hibiscus-tinged effervescent sake. This one went down easy, and though it was unabashedly saccharine, it did have a nice ricey finish that I appreciated. 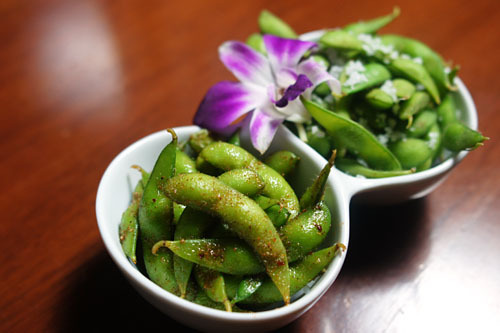 The standard edamame here, sprinkled with sea salt, was tasty as expected. Far more interesting, but not necessarily better, was the steamed, Indian-spiced version, tossed with an admixture of spices, including cinnamon, black pepper, and nutmeg. 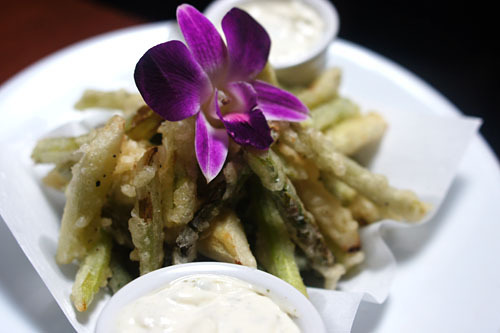 Next was a superb presentation of tempura'd asparagus. I appreciated their lightly crisp exteriors, but what impressed me even more was how the essence of asparagus was so nicely preserved underneath all that. I quite enjoyed the asparagus alone, but the nori aioli did add a creamy tinge of seaweed to things. 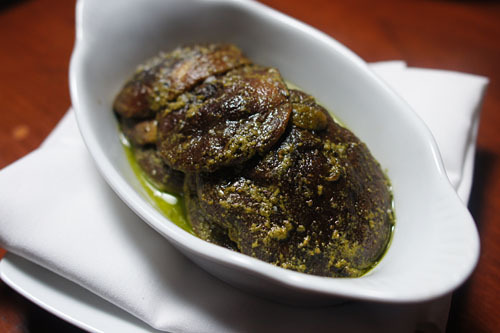 Here were shiitake mushroom caps, cooked in a sort of pesto-inspired sauce. Surprisingly, the tanginess of the pesto was a rather fitting foil to the earthy savor of the mushrooms. Matt commented that he could still taste the 'shrooms several courses later--talk about a lingering finish! There were three different types of accompaniments to the nicely-textured Kumamotos here, though unfortunately, I didn't quite catch what they were. I enjoyed the sharp, refreshing tang of a jalapeno-shallot version, but the flavor of the soy-ponzu(?) preparation overwhelmed the bivalve. I wasn't able to try the third variation. 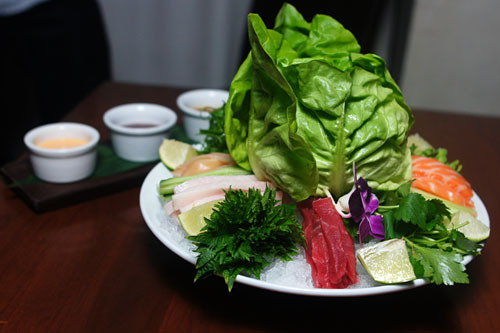 On a platter were sake/salmon, maguro/tuna, tai/snapper, hamachi/yellowtail, and aoyagi/orange clam, served with a variety of vegetables, and accompanied by a wasabi vinaigrette, a Korean-inspired gochujang, and a spicy mayonnaise. I tried a few bits of fish alone, and the cuts seemed to be of suitable quality. However, it was much more interesting to pair the fish with the various accoutrements. I especially enjoyed using the gochujang, which, combined with the sashimi, reminded me of my meal last November at saengseon hoe specialist Neptune's Lounge. 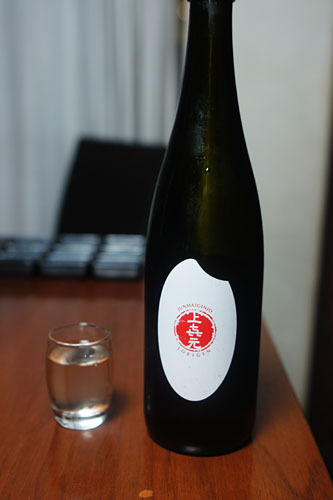 At this point, we moved on to a more "serious" sake, the "Good Spirits" Jokigen Junmai Ginjo, a somewhat prototypical example of the style--somewhat dry, a bit hot, with some slight fruity-floral character for good measure. 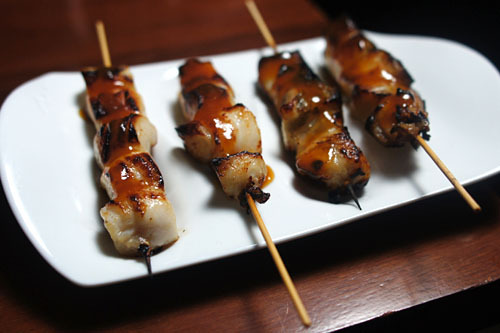 Not surprisingly, we were all reminded of Nobu's signature "black cod with miso" here. The fish itself was quite oily, and rather tender, too much so, in fact; I would've preferred a firmer, flakier consistency. Nevertheless, it did have a tasty, sweet, miso-hued sapor that compared favorably to that of Nobu's version (which I've had at Matsuhisa Beverly Hills). A trio of dipping sauces were provided--hot mustard, sweet vinaigrette, garlic ponzu--but they proved unnecessary. 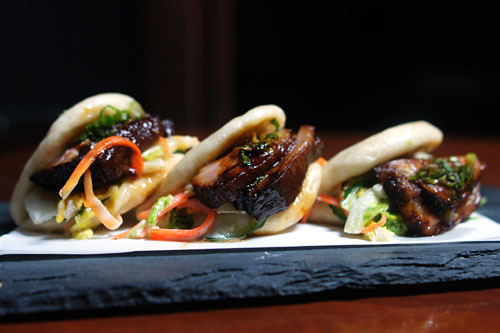 One of the highlights for me were these Momofuku-esque buns. The pork belly was undeniably decadent, melt-in-your-mouth even, but was tempered so beautifully by the tanginess of the cucumber and Kewpie mayo slaw (perhaps another nod to David Chang?). The only issue was the bun itself, which I found a bit thick and soggy (Javier, however, liked it thick). 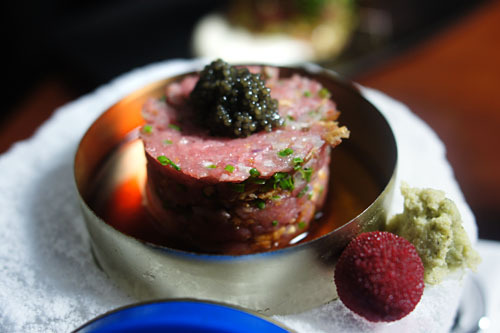 Next came another seemingly Nobu-inspired dish: toro tartar with caviar, which I also consumed at Matsuhisa. Here, I really liked how the fattiness of the tuna was moderated by the pronounced zest of the scallion and the heat of the wasabi, while its weight was accentuated by the soy-dashi broth. The caviar, meanwhile, gave things a delightfully briny finish. Again, this compared very well to the original. Following was another strong tuna dish. 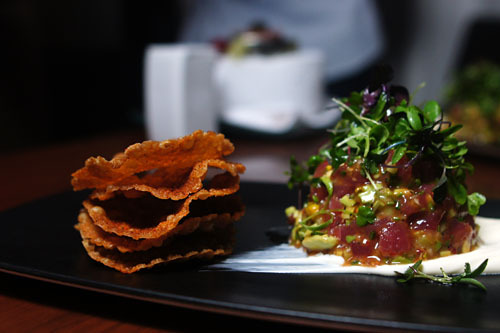 I loved how the richness of the tuna was elevated by the use of avocado, while the cucumbers added a cooling contrast. The nuttiness imparted by the pistachios was superb, and I liked how the vinaigrette gave just a bit of spice on the finish, punctuated by the vegetal tang of the greens. The end result was a delightful mélange of sweet-salty-sour-spicy. I could've done without the truffle aioli, though. Alone, I quite enjoyed the snappy texture of the lobster sashimi, along with its delicately sweet, yet briny flavor. However, the kitchen was a bit heavy-handed with the crispy onion, which I felt overpowered the subtle nature of the crustacean. The bitterness from the accompanying micro greens did help smooth things out, but even they weren't enough. 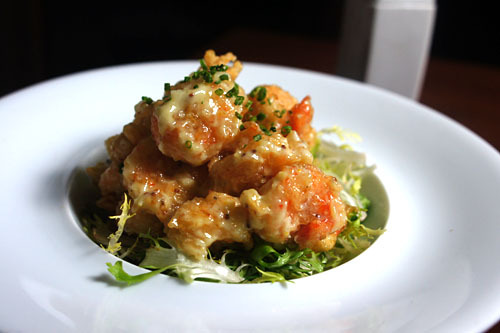 The dish reminded most of us of Chinese-style honey walnut shrimp. I rather liked their crisp consistency and the sweet-spicy nature of the wasabi aioli, tempered by the bitterness of the frisée. 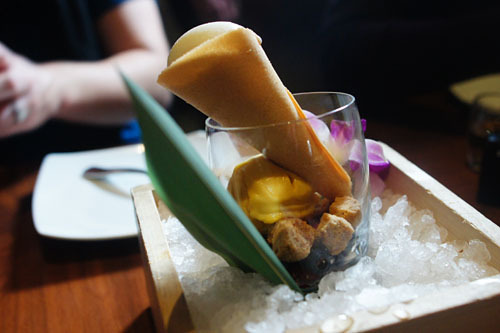 Taken separately, I liked how the firm, snappy, subtly-flavored tai was accentuated by the sweet creaminess of the uni. However, the shiso salad was a bit much for me, masking and distracting from the natural sapor of the seafood. I usually abhor corn dogs, but I was a big fan of this! 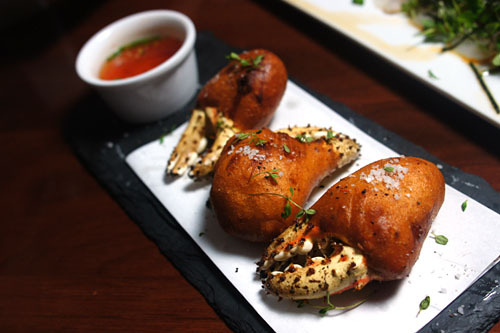 The crab was soft, sweet, briny, and delicious--just as it should be. The problem, however, was that the claws were notoriously difficult to eat. After the first bite, I was forced to pick out the remaining meat with my chopsticks, which proved to be an exercise in futility! 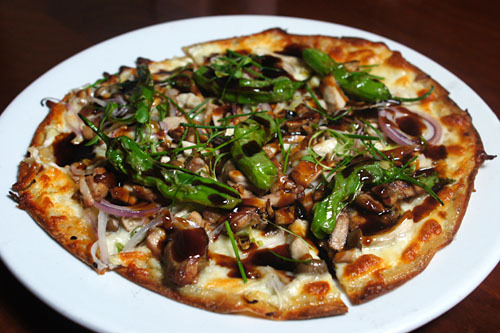 When I heard that we were having teriyaki chicken pizza, I instinctively rolled my eyes. However, upon tasting the dish, I found that the sugariness of the chicken was surprisingly restrained here, playing nicely with the piquancy of the onion and shishitos. Nice, crisp crust too. This was a much lighter pizza compared to the one above, and worked a bit better for me. I quite liked the interplay between the delicate tuna and its tangy vegetal accompaniments, the tomato and onion in particular. 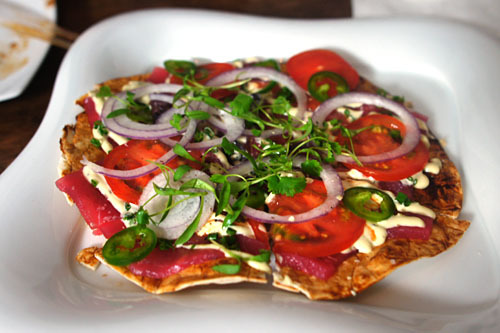 The super-thin, cracker crust is worth mentioning as well. Surprisingly good! 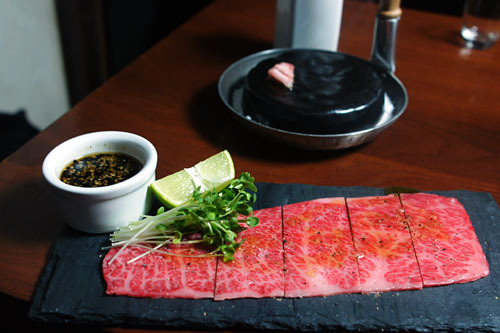 16: wagyu "hot rock" | thinly sliced japanese wagyu beef prepared "table side"
That, simply, is a beautiful piece of meat. 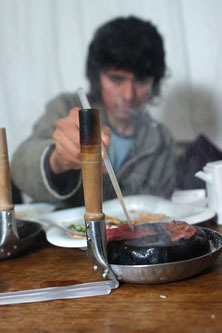 I could've eaten it raw, but allowed it to be cooked (by Javier), releasing its amazingly rich, fatty, salty, unctuous essence. Note that the "rock" appears to be the same model that Urasawa uses for his to-die-for seared toro! 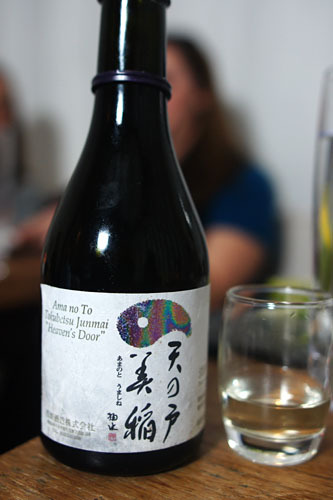 Our next sake was the "Heaven’s Door" Amanoto Tokubetsu Junmai, a drier sake compared to the Jokigen, with a bit more herbaceous character. 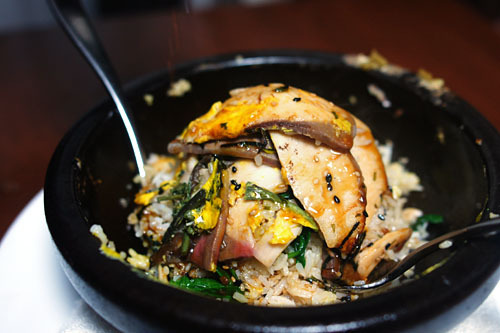 As you might expect from looking at the photo, this was Sashi's version of the Korean dolsot bibimbap, replete with stone bowl. This was a superb salmagundi of different tastes and textures, and I especially enjoyed the interplay of the salty fish with the luscious jidori egg. Nevertheless, some more spice--in the form of kimchi or gochujang--would've been nice. And where's my nurungji? Next up was some more Korean-inspired fare: the ubiquitous galbi, or marinated short ribs. 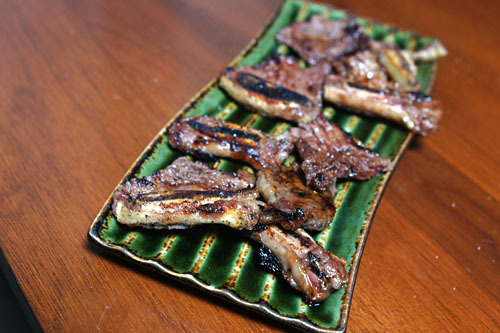 According to Matt, they were cut in "LA Kalbi" fashion, or perpendicular to the bones, for easier eating. Flavor-wise, they were quite competent, replete with the smoky-sweet savor that I expected. 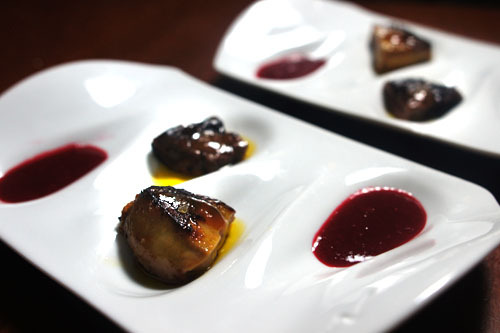 This tasted more like chicken liver than fattened goose liver to me, as it lacked foie gras' heady, oleaginous character. Nevertheless, the dish was surprisingly good--I appreciated the liver's subtle, yet focused flavor, as well as its slightly nutty finish. It wasn't overly sweet, which is always a huge plus for me. The accompany raspberry sauce was redundant. Our last savory course was also Chef Okuwa's signature dish, and my favorite item of the night. It's an ode to a popular soup invented in his hometown of Nagoya (despite the name, it did not originate in Taiwan! 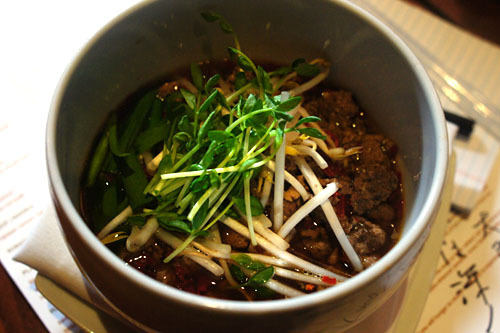 ): a spicy medley of ground meat, chives, bean sprouts, red peppers, and ramen, all in a soy/dashi-based stock. I loved the firm, fiery meat and how it was tempered so wonderfully by levity of the crisp, crunchy bean sprouts, while the noodles grounded the dish with a homey simplicity. 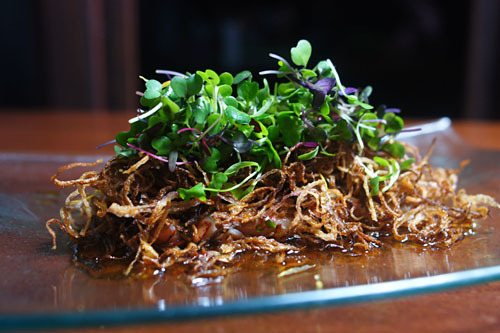 A perfect interplay of tastes and textures--this one's worth coming back for! 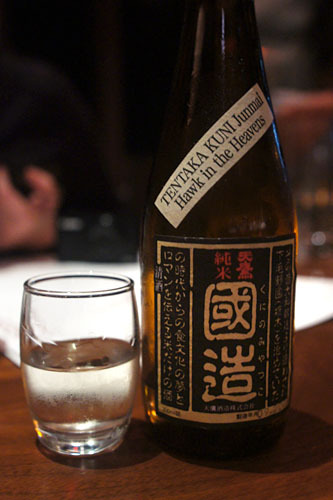 The final bottle of sake, to go with the desserts, was the "Hawk in the Heavens" Tentaka Kuni Junmai, a dry, substantial sake that stood up well enough to the sweets. 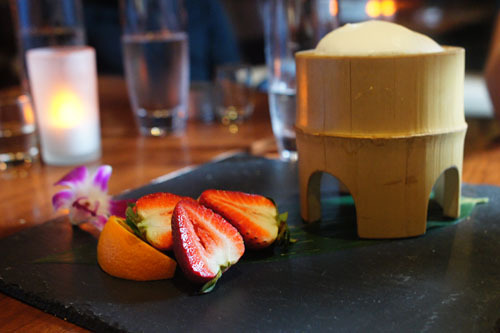 Desserts are crafted by Pastry Chef Kei Hasegawa, who comes to Sashi from Nobu. 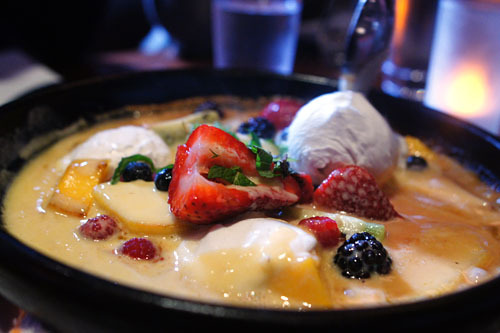 First up was this mishmash of various fruits, bubbling in a bath of passion fruit/white chocolate liquid, with a scoop of coconut ice cream tossed into the fray for good measure. It was a sugary, buttery, hot fuss, and though others raved about this one, it was just a bit overwhelming for me. The second dessert was more to my liking. 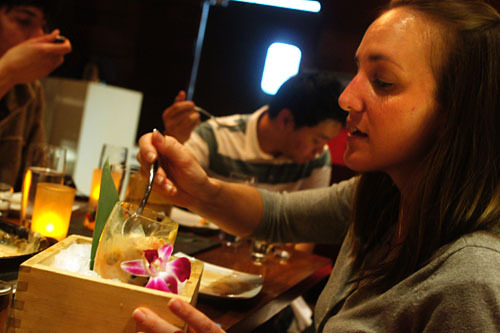 As Sonja demonstrates, we were instructed to break up and mix the contents of the parfait-like dish, resulting in a pleasantly sweet-sour commixture, with a nice crunchiness courtesy of the cone. Finally, we were left with this multilayered affair, composed of strata of chocolate-orange mousse, cinnamon crumble, green tea ice cream, and Cointreau foam. The slightly astringent sapor of the green tea formed the core of this dish, and to it the richness of the chocolate-orange, the spice of the cinnamon, and the tangy finish of the liqueur added layers upon layers of complexity and depth. Very nice--my favorite of the trio. Given Sashi's reputation as somewhat of a cougar den, I was a bit wary of the place. However, I was pleasantly surprised with the food. Clearly, Chef Okuwa's training has paid off, as it's evident that he knows what he's doing in the kitchen. The food is fusion, but fortunately, Okuwa doesn't go overboard with the global flourishes, and doesn't stray too far off from his traditional Japanese roots. Think of this as Morimoto, for the beach crowd. kevin he wrote "夢は大きく根は深く" a Japanese wisdom, writem by Mitsuo Aida(1924-67), born in Tochigi Prefecture, it translate to "dream big, deep root". it will tranlated "If you want to have big dreams roots deeply become don't. If deep roots, dream becomes significant"
what he really mean was "Look deep in order to have a big dream, but it is when the dream came from your deepest part, then the dream will become significant to you." Most of Mitsuo Aida writing are like this due to after graduating from junior high school, he met Tetsuo Takei, a Zen monk of the Sodo and learn about Buddhism from him. During the interview, the inventer/Owner MingYu Guo claim the dish start out as Taiwanese version of DanDan Noodle, but the people in Nagoya perfer strong favor, so he add extra spice to it. It out to be a hit, later on people in Nagoya want to honor his root and decdied to call it "Taiwan Ramen Noodle"
Everything looks and sounds delicious... I've heard about Sashi before, but never thought twice about actually going. I'll definitely to hit this up very soon! I feel like this place is targeted at the Katana/Katsuya/Sushi Roku crowd. In my opinion, it far outshines all of those. A real worthy place for Manhattan Beach. You should check out Cafe Pierre down the street. The new menu has been getting some pretty good reviews lately. Dason: Thanks for the clarification regarding the quote and the noodles. When we asked the Chef about the quote, he translated it as "big dreams have deep roots." Helen: I was a bit skeptical about adding chogochujang to sashimi at first, thinking that the sauce would completely obliterate the taste of the fish, but it actually turned out quite well! Anon: I haven't been to Katana, Katsuya (the new ones), or Sushi Roku, but given what I've heard about them, I think that's a reasonable statement. How has Cafe Pierre changed since Remi Lauvand was brought in? the food looks yum!! good job. I am very interested in your blog but your layout makes it near impossible to read. I think your photos are great but the layout makes it difficult for me to read more than a few paragraphs of written content. Leyla, can you tell me what specifically you have issues with?